The former Fine Gael strategist and Rehab board member is also facing calls to come before the Public Accounts Committee. THE FORMER FINE Gael strategist and Rehab board member, Frank Flannery, will now also step down from his role as chairman of the Forum on Philanthropy and Fundraising, the Tánaiste has told the Dáil. Speaking during Leaders’ Questions, Eamon Gilmore said that he understood Flannery is stepping down from his position as chair of the body tasked with encouraging wealthy people to give more money to charity. It comes following calls from the opposition for the government to sack Flannery from that role if he does not agree to appear before the Public Accounts Committee (PAC) to answer questions about his role as a consultant and lobbyist with Rehab. Fianna Fáil leader Micheál Martin said that reports that Flannery was in the Dáil the day that Rehab chief Angela Kerins was giving evidence to PAC last month constituted him “metaphorically giving the two fingers” to the committee. Flannery is under pressure to come before the PAC with Fianna Fáil saying that questions remain unanswered. He resigned from the board of Rehab and from his roles with Fine Gael yesterday following revelations about lobbying work he carried out on behalf of the disability organisation. He continues to face calls to appear before the PAC to answer questions about his membership of the Rehab board, his consultancy work for the disability charity and his pension arrangements. Gilmore told the Dáíl that there was “nothing wrong, per se, with lobbying” but said that forthcoming legislation will introduce a register of lobbyists so the public will know who is lobbying whom and for what reason, promising “absolute transparency”. Earlier, Fianna Fáil TD and PAC member Seán Fleming said that “somebody just leaving the pitch is not sufficient. The questions still remain to be answered”. Fleming also raised concerns about Flannery’s role as chairman of the Forum on Philanthropy, a role which he was appointed to by the government, and whether this would be tenable if he refused to appear before the PAC. “If Frank Flannery doesn’t make clear immediately that he will come before the PAC we will be asking the Taoiseach to make it clear to Frank that it’s not compatible for the chair of a government body not to cooperate with an Oireachtas inquiry,” he said. Sinn Féin president Gerry Adams said that it was not tenable that Flannery remain as chair of the Forum on Philanthropy if he refuses to go before the PAC. 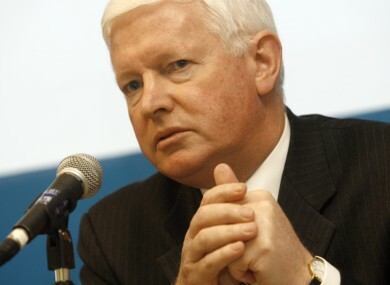 Adams said that Flannery’s resignation “changes nothing about the call for him to go to the Public Accounts Committee”. Read: Who is Frank Flannery and why is everyone talking about him? Email “Flannery to quit philanthropy body, accused of ‘metaphorically giving two fingers’ to PAC”. Feedback on “Flannery to quit philanthropy body, accused of ‘metaphorically giving two fingers’ to PAC”.